How to tackle Chunk Upgrade with Modified Forms/Reports? This post an extension of Sivakumar’s post on How to Deploy Chunk Files. Let’s consider, we have a Custom Product chunk file which has been deployed already on a Customer’s site. And we are suppose to deploy an update to that product. Now this particular Custom Product has been modified either the Forms or Reports or Both. 1. The developer who has developed this customization, maintains a version to each release. 2. The developer do not maintain the version for releases. Let’s first take the #2 scenario: The developer do not maintain a versioning for releases. Which is very difficult and time consuming when we deploy. How to deploy this chunk without harming the Forms AND / OR Reports Modifications? David just explained it to Siva, which is clearly explained in Siva’s post. Let’s first take the #1 scenario: The developer maintains a versioning for each release. I would salute such developers. It’s very rare to see developers maintaining a version for small customizations. If it’s a Dex Customization, it MUST have a version, a proper version. Versioning Dex Customizations have got so many advantages. One such advantage is the one which I am going to explain below. If we have a version for a chunk and we are trying to deploy an update (which will logically have a higher version than the one which was deployed earlier), then GP Utilities will take care of deploying this chunk and upgrading the Forms & Reports Modifications. 1. Install the chunk on GP Site (copy the chunk on to GP Application Folder and launch GP). You won’t be able to log on, if there is a Modified Form(s) for this product. 4. 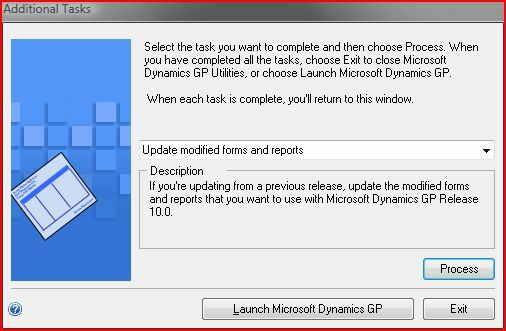 Verify GP Dynamics Version and Company Databases Versions. 6. Just make sure that you have backed up Dynamics.set file and Modified Forms Dictionary for that Customization chunk. Important Note: You must copy the Previous version Modified Forms dictionary to another folder (remember, COPY and NOT Move). And follow the instructions shown in the subsequent wizard steps. For more details, just refer to GP Utilities Help File (Click on that BLUE ? Button shown in the above screenshot and read the instructions). Thanks so much, Sivakumar & David, for giving me a topic to share with our community. Sivakumar’s Article on How to Deploy Chunk Files – A Note To Remember.